Butterflies are cold-blooded insects that require the sun’s warmth to help their bodies work. However, you can grow both host and nectar flowering plants in shaded gardens adjacent to sun-drenched areas like driveways or patios, and still, attract winged visitors. In addition to butterflies seeking shelter from wind and rain, woodland butterflies like those in the satyr group may flit amongst your shady offerings. Add a mud-puddling area to provide minerals and drinking water, or a small log pile for roosting, and watch your butterfly population grow. 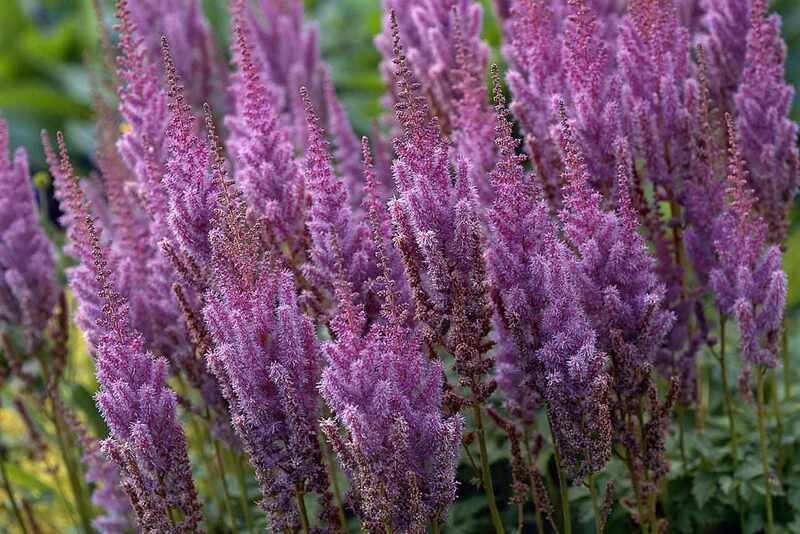 Astilbes require copious moisture to thrive in the landscape; in fact, a rain garden is an ideal setting for these plants. Adding humus to the soil and using mulch generously will help keep the root system moist for healthy plants. Also called wild aster or starwort, this 3-foot perennial is smothered with daisy-like white flowers in late summer and fall. This low maintenance native shrugs off pests but does appreciate consistent moisture. Gardeners may need to stake plants grown in shady gardens to maintain a tidy appearance. Heliopsis flowers are tough plants that grow in average to heavy clay soils in areas as cold as zone 4. Partial sun is better than full shade for these flowers, but the plants can take over the garden if they like their site. In addition to nourishing butterflies, these nectar-rich plants are an important source of food for all types of bees and beneficial wasps. Remove spent blooms to reduce self-seeding volunteers. Impatiens may seem like clichéd bedding plants that pop up at every big box store in the spring, but improved varieties of this annual make it more versatile than ever for the shady butterfly garden, especially container gardens. The ‘Xtreme’ series tolerates hot summers and blooms continuously without pinching. The ‘Impreza’ series was bred to spread, covering your bare soil with flowers. All impatiens are easy to grow from seed, if you start them indoors about two months before last frost. Impatiens like ample amounts of water, and even do well on the banks of streams and ponds. Joe pye weed is a standout specimen in large sunny borders and cottage gardens, but the flowers can tolerate dappled shade or afternoon shade. True to is name, the large plants can spread rampantly in untended spaces, but the smaller stature of ‘Little Joe’ Eupatorium plants make them more manageable in the small shade garden. Growing plants in a dry area also limits their spread. Fritillary butterflies will feast on the leaves of the native Viola odorata, which grows as a shady groundcover. The petite plants are easy to tuck between rocks or at the edges of paths, where you can observe their tiny spring blossoms. Plant a named cultivar like 'Rosina' or 'Governor Herrick' for reliable performance and fragrance. Sweet violets can be invasive, so you may need to take steps to keep them in bounds. Plants spread by prolific self-seeding, and deadheading the tiny plants is tedious, so a heavy mulch will reduce (but not eliminate) the spread of the plants. Yanking small seedlings when they emerge will also keep them from creeping into lawns or neighboring garden areas.